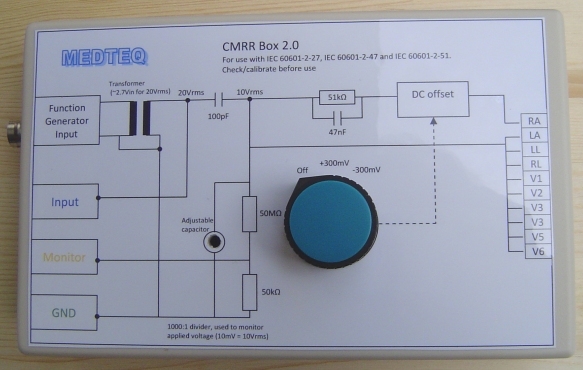 ECG related standards such as IEC 60601-2-27, IEC 60601-2-47 and IEC 60601-2-51 require a common mode rejection ratio test (CMRR) utilising the double box construction as described in each standard (all standards are the same). 2Due to the high impedance of the internal 100pF capacitors at mains frequency (around 30MΩ), normal multimeters cannot be used to measure the applied voltage. A 50MΩ 1000:1 divider has been found to be the best compromise for accuracy and impact to the test.